When friends Patri Morillo and Pep Aguilar graduated from college and began looking for work as agricultural engineers, a common response from potential clients was, “we’ll call you.” Now, 15 years later, the duo has turned that phrase — in Spanish, “ya le llamaremos” — into a tongue-in-cheek reference to their winemaking team. Morillo and Aguilar grew up near Barcelona. Neither was raised in a family with wine connections, but harvesting and toiling in cellars got them hooked. In 2010, after working for other wineries, and then as vineyard consultants, the two launched Celler Comunica, a winery in Montsant, an up-and-coming wine region in northeast Spain, a couple hours west of Barcelona. Montsant, characterized by high-altitude vineyards growing in a dry Mediterranean climate, was designated as its own wine region relatively recently. Before 2001, this roughly 5,000-acre area, encircling more well-known Priorat, was part of the Catalan province of Tarragona. Grapes, which usually appear in blends, include garnatxa (garnacha or grenache), samso (carinena or carignan), and some syrah. People often ask Morillo why he and Aguilar set up shop in Montsant rather than in the more famous Priorat, known for its prestigious and powerful reds. While he describes Priorat as “magical” (both he and Aguilar worked and consulted there), the lesser-known appellation is more like home. 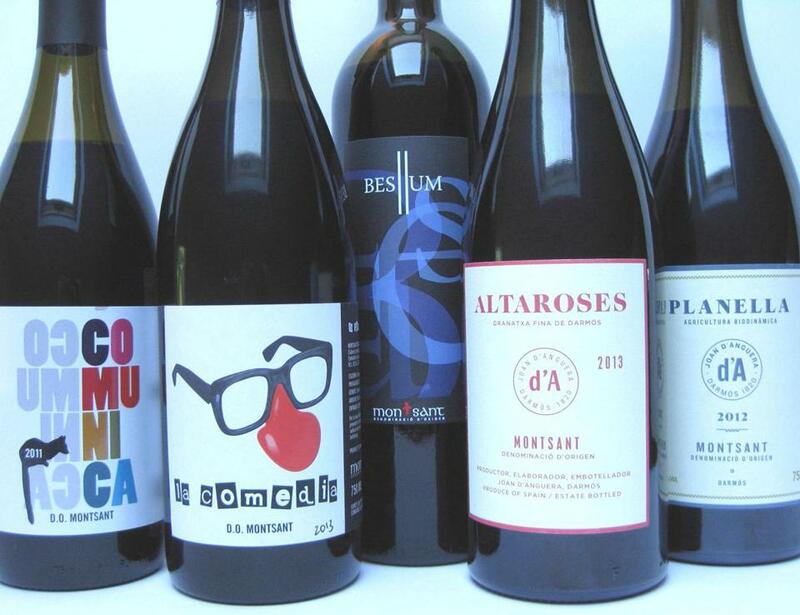 “In Montsant, we feel free,” the winemaker explains by e-mail, describing the place as an “appellation for young people” who are making value-driven wines of great quality. He is keen on coaxing fruit with distinct character from the granitic and sandy soils. The duo chooses not to age their wines in barrels. Their reds see no oak at all. The winemakers ferment the juice in plastic tanks, and allow the developing wine to age for almost a year on a thin layer of lees, the yeast cells that fall to the bottom of the vessel after doing the work of fermentation. Morillo wants to showcase the fruit without the influence of wood. Other producers in the region use oak with a judicious hand. Biodynamic winery Joan d’Anguera, now run by the sons of the founding winemaker, ages two wines — “Altaroses” and “Planella” — in old barrels so that fruit is supported and refined rather than masked by vanilla-like flavors that can come from new oak. Celler Malondro, making a red called “Besllum,” uses a mix of new woods, but matures the wine in-bottle for nearly a year, resulting in a polished pour. It is a true joy to taste the verve and range of styles coming from this distinctive region. The winemakers are also delighted. Morillo still gets a kick out of how people invoke their team name, forged years ago. “They say, ‘We will call you!’ ” he says. The difference is, now they do. Celler Comunica “Comunica” 2011 Pretty scents of crushed dried violets combine with aromas of dusty soil and plum skin. A smooth operator, plummy yet lithe, with a modest dollop of tannins. Excellent with white bean and vegetable soup drizzled with pesto. Around $23. At Streetcar Wine & Beer, Jamaica Plain, 617-522-6416; Federal Wine & Spirits, Financial District, 617-367-8605. Celler Comunica “La Comedia” 2013 Like its name, this young ruby quaff is as lighthearted as its texture. Craft is evident in this lavender and plum-scented pour that features notes of smoked meat and violets in a cherry-berry fruit profile. A delight with a platter of jamon serrano and a crusty loaf. Around $23. Dave’s Fresh Pasta, Somerville, 617-623-0867; Formaggio Kitchen, Cambridge, 617-354-4750. Celler Malondro “Besllum” 2011 This polished red offers scents of plum, spiciness from oak, and leafy forest-floor notes. Generous, fine-grained tannins support dark fruits, violets, plus appetizing soil and black pepper notes. Serve with pork tenderloin stuffed with apples and dried cranberries. Around $18. At Gordon’s Fine Wines & Liquors, Moody Street, Waltham, 781-894-2771; Local Vines and Gourmet, Cohasset, 781-383-8463. Joan d’Anguera “Altaroses” 2013 A beguiling winsome-weight red suggests cherry and purple flowers on the nose. On the palate, red plum skin, petals, and soil appear in this brightly tart pour with gentle tannins. Pair with a wedge of the classic tortilla espanola. Around $17. At Streetcar Wine & Beer; The Spirited Gourmet, Belmont, 617-489-9463. Joan d’Anguera “Planella” 2012 Black cherry and plum show up on the nose and palate in this deep-hued pour. A subtle smoked meat note offsets dark-skinned fruit, plush plentiful tannins, and appetizing acidity. A winner with grilled pork sausage and French lentils. Around $20. At The Spirited Gourmet; Streetcar Wine & Beer.